ID: Blunt, rounded nose. One relative large spot on each wing. Comments: I infrequently note the magnificent big skate. 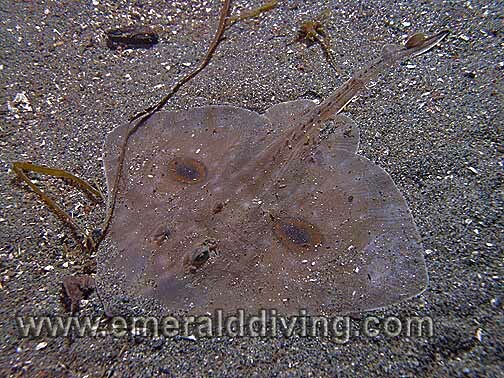 When I am fortunate enough to encounter this skate, it is usually while diving extensive soft and relatively flat substrates. Big skates can reportedly grow to 8' in width, although I have never seen one more than 36" in width. I obviously need to dive more. ID: Sharp, pointed nose. One small spot on each wing. 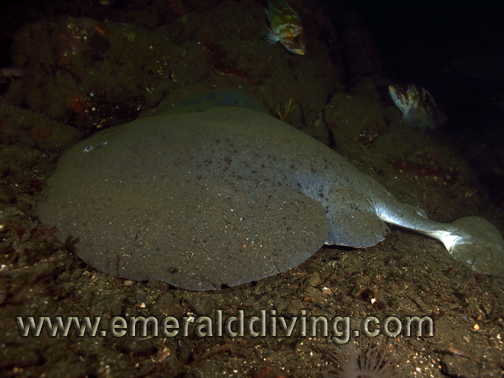 Comments: With it's pointy nose, the longnose skate is easy to discern from the big skate. I note longnose skates much more frequently than I do big skates. They seem to move into areas like Three Tree Point during certain times of the year (fall and/or winter). 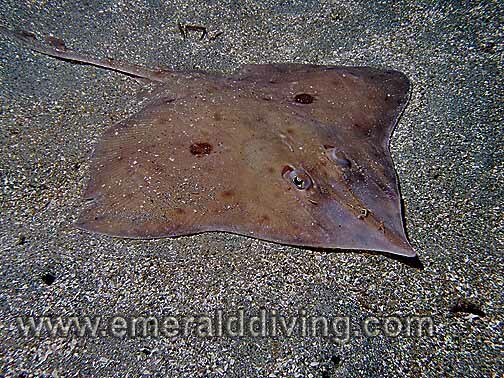 I have noted longnose skates as shallow as 15 feet and at depths over 100 feet. Typical size: up to 4.6' in length. ID: Thick, round body. Full tail fin. Serious - there is nothing else like this in our waters. Comments: Ranging from Baja to BC, these rays are a very rare sighting in WA and BC waters. Two kidney shaped organs within the ray can produce an electric charge up to 45V, which is enough to knock a man down and certain stun a fish. All marine life should be treated with resepct, this deserves extra merit as it carries a taser. ID: "H" shaped egg purse with a bulging middle. Yellow color. 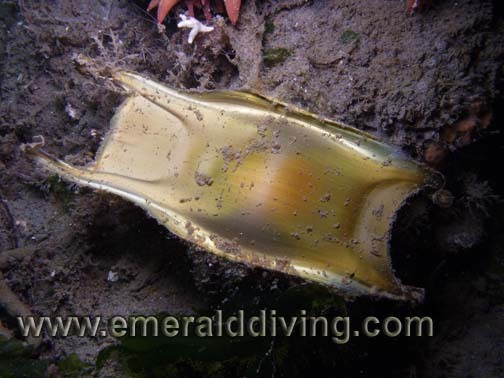 Comments: I only occasionally note these egg cases attached to the substrate. 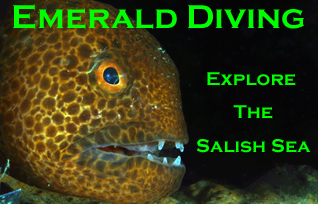 This photo was taken while diving Possession Point Fingers in Puget Sound. ID: Long slender tail, large eyes, rodent-like front teeth, gold-copper metallic skin with white spots. Sharp poisonous spine behind first dorsal. Comments: Ratfish are commonly noted throughout all Washington waters, but they do tend to come and go. The ratfish swims gracefully with it oversized pectoral fins. Like dogfish, ratfish have a single and slightly venomous dorsal spine. 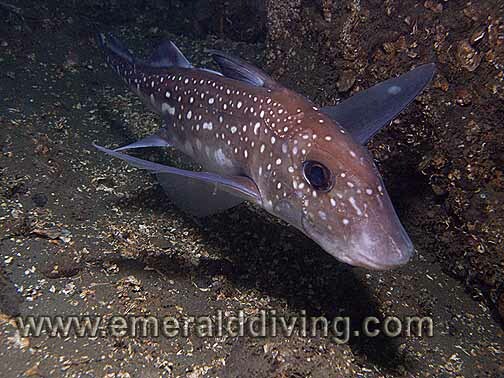 Ratfish are sometimes called chimeara or rabbitfish. ID: Slender body with two dorsal fins. Sharp spines on leading edge of each dorsal fin. Typically has a row of white spots along the side. Comments: Scorned by fishermen, dogfish are a true spectacle underwater . I only occasionally note these sleek swimmers as they rest on the bottom or leisurely patrol a reef. On a couple of lucky occasions, I have witnessed dogfish rounding up herring. 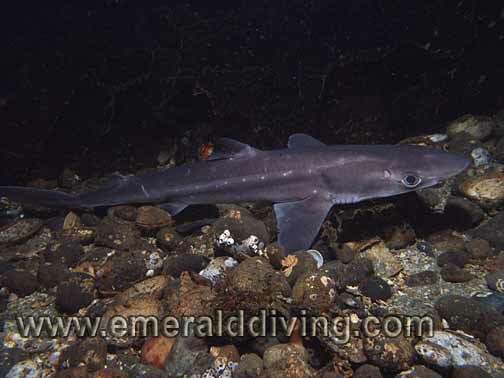 Dogfish have a slightly venomous and sharp spine on both dorsals.